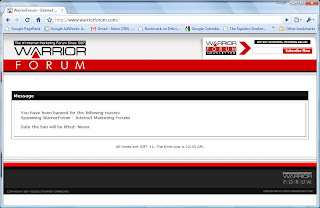 Well it looks like im another victim of the Warrior Forum's banning of innocent people. Date the ban will be lifted: Never. So i guess thats it then. Banned for life! I've send a helpdesk request to ask why i was banned, but i dont really expect an answer. In the meantime, as a paid up member of the WarRoom ($37 lifetime membership) which i can no longer access, Ive filled a complaint with PayPal to get a refund, afterall what use is a lifetime subscription to a site i cant access!!?? Thats tough! Sorry to hear that....just ask them to get you back in, hope that helps. If not, you can just get a new computer w/ a new IP....sorry you went through it. Stay positive....everything happens for a reason.